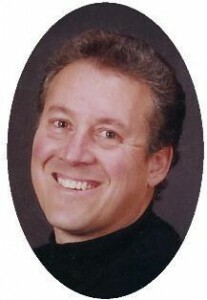 James W. Braby, 46, of S High Street, Port Washington, died unexpectedly at his residence Saturday, March 4, 2006. He was born November 11, 1959 in Port Washington, Wisconsin to Ward J. and Joan E. Bichler Braby. He attended St. Peter’s School and graduated from Port Washington High School in 1978. He began working for Simplicity Manufacturing Company in Port Washington. He worked his way up to Lead Man over 25 years. He was a member of the International Association of Machinist and Aerospace Workers, Local 1430. Jim was kind and helpful to others, possessing a smile that would light up a room. He was always supportive of family, especially his son and nieces and nephews. He enjoyed the outdoors and fishing. Golf was his passion and he participated in a weekly league at Squire’s for years and enjoyed golfing around the country. His is survived by his son Chris Braby of Random Lake, fiance Cindy Zozakiewicz and her children Caitlin and AJ of Port Washington, former wife Debbie Braby of Random Lake and step-son Scott (Sara) Zimdars of Fredonia. Further survived by his parents Joan and Ward Braby of Port Washington, brother Bill Braby of Port Washington, Jean (Mark) Jacoby of Erin, WI, Joanne (Dave) Dahm of Random Lake, nieces, nephews, other relatives and many friends. The Rev. Pat Wendt will celebrate Mass Of Christian Burial 7 pm Wednesday, March 8, 2006 at St. Peter of Alcantara Catholic Church, 1800 N Wisconsin Street, Port Washington. Interment parish cemetery. Visitation 3 – 6:45 pm Wednesday at St. Peter of Alcantara Catholic Church. Memorials appreciated.